Each rabbit was peaking out of a stocking on Christmas morning. So cute!
. You can also find the pattern on the Martha Stewart website. I made this in a lightweight charcoal grey wool coating, the same fabric I used to make the kids fall hats, with quilting cotton for the ears. I have four kids, so each one needed a different bunny. The green ears are Flea Market Fancy Flower and Dot in Green by Denyse Schmidt from FreeSpirit. The pink ears are Starlet in pink by Blank Quilting. The blue is Fusions Collection Full Circle in teal by Robert Kaufman. I’m not sure about the red. I picked up a fat quarter at the local quilting store and there’s no text on the selvedge. But if you recognize it, let me know! 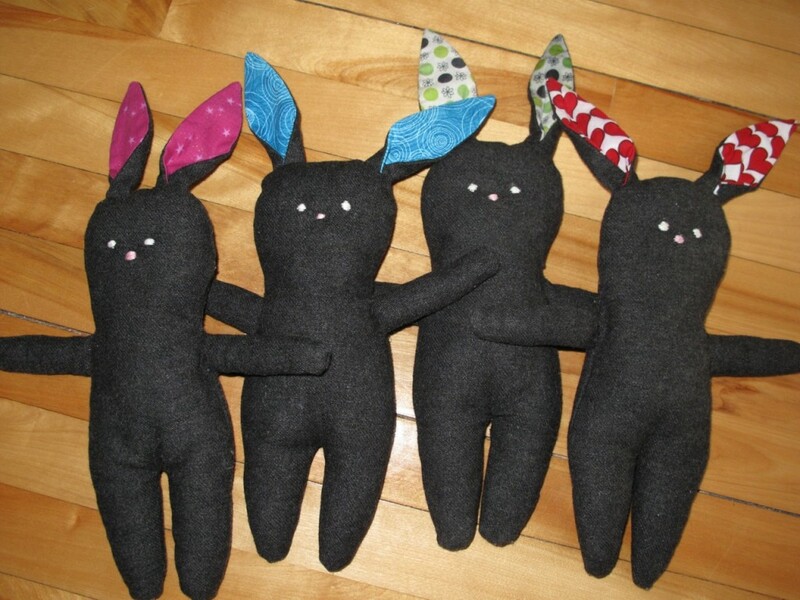 Pattern Review: Stuffed Menswear Bunnies by Martha Stewart (PDF) from Martha Stewart’s Encyclopedia of Sewing and Fabric Crafts . Fabrics: wool coating and quilting cotton. I reduced the pattern when printing the PDF to get smaller bunnies. 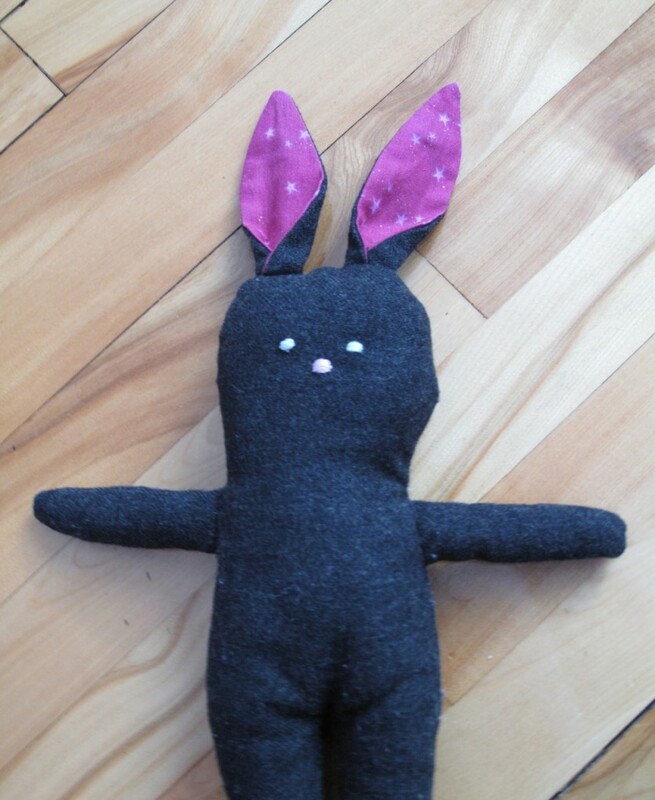 The original pattern makes a bunny that is about 20″ tall. Mine are only about 12″ tall. 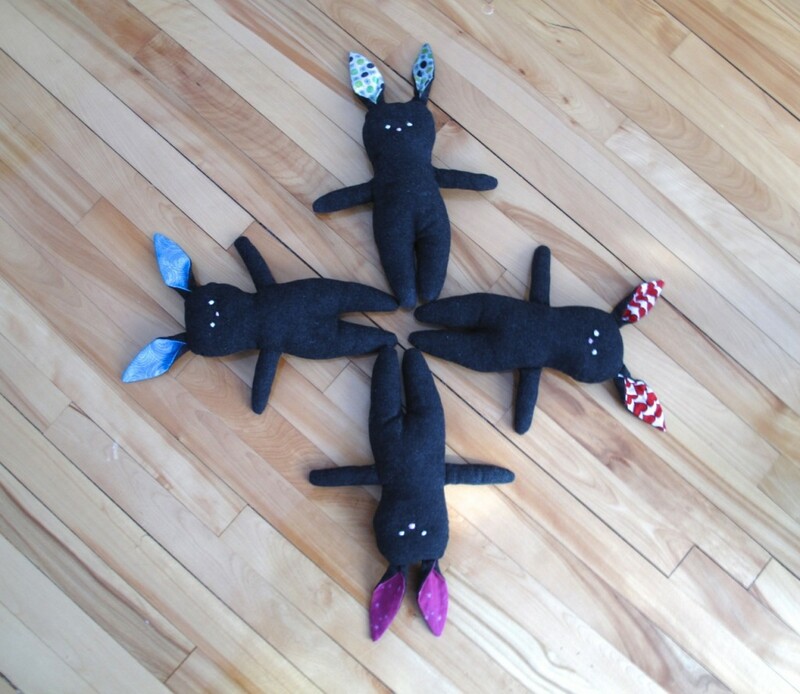 This is a better size for small children, with the added bonus that the kids can put their doll clothes on the bunnies. Results: fantastic. I would definitely make this pattern again. Thanks! They were lots of fun to make. As I told you on flickr, I am in LOVE with these bunnies. I would seriously buy one. Do you have an Etsy ? If so, please let me know. Next Next post: Capes. Yea or Nay?